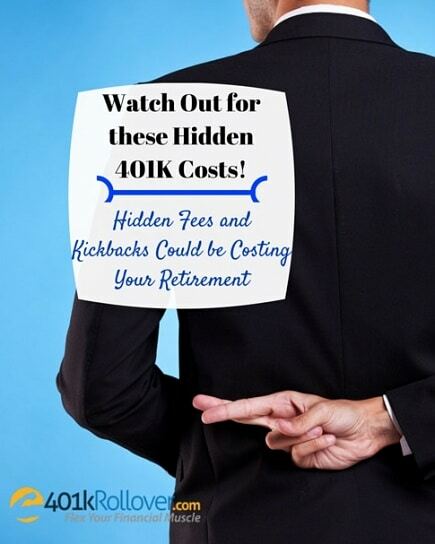 Watch Out for these Hidden 401K Costs! A recent AARP study found that 80% of plan participants didn’t know how much they were paying in 401K costs. That’s not entirely surprising considering the myriad of ways 401K administrators and advisors try to cover up high fees and expenses in employer plans. Mutual fund returns may be reported as gross returns, which means the return on the fund before expenses and fees are taken out. That great historical return on which the 401K advisor bragged and sold you into the mutual fund may actually be much lower when accounting for expenses. If that were not confusing enough, some mutual funds report their returns net-of-cost, subtracting the annual management fee, but not subtracting other 401K costs like record-keeping fees. It’s all kept very secret so you don’t know if your fund manager is under-performing the market. A difference of a few percent in 401K costs may not seem like a big deal but just 1% in additional fees but it really adds up. Compare two 401K investments of $100,000 with each earning 7% a year. One charges 0.5% in fees while the other takes 1.5% off in costs. That 1% means a difference of $229,000 over 30 years. The biggest cost in your 401K is probably the annual management expense on each fund. Look for something called the expense ratio or management fee. This will be reported as a percentage and is taken on your total investment in the fund each year. If you have $25,000 invested in a fund with a 2.5% expense ratio then you will lose $625 a year in management costs. It may not seem like much until you consider how much you’re paying on a $200,000 portfolio, upwards of $5,000 for the above expense ratio. One of the most insidious costs you may not know about is for “revenue sharing” which may not even be disclosed. This happens when some of the operating expenses you pay on the 401K plan get kicked back to the company to lower its plan costs. You could be unknowingly funding your boss’ retirement and not even knowing it. Load fees, also called 12b-1 fees, are commissions paid to brokers and advisors as an incentive to sell mutual funds to investors. Why would a good investment need to offer a commission of up to 5% to advisors to recommend the fund to their clients? The answer is because these are not such great investments, often charging high expenses and missing return targets. Your plan administrator may even be limiting your 401K investments to mutual funds that offer these large kickbacks. Larger companies usually pay their 401K plan expenses for employees but smaller companies often pass the costs on in what’s called a plan operating expense. This won’t be reported in fund returns but should be noted on your quarterly statements as a 401K cost. Look for hidden costs like a portfolio management fee, load fees, mortality charges for a 403(b) plan, and administrative expenses. Your plan administrator is required to send you a statement and it should present all the fees in a clear manner. Unfortunately, regulations have left it up to the individual companies to show their 401K costs in a way that’s easily understandable for participants. Understand the hidden costs that 401K plans and employers try to get over on their participants. If you plan refuses to work with you on the costs or if you have an old plan from a previous employer, consider a 401K rollover to lower your costs and take control of your retirement money.